Musings on writing, books and life in general. So who the heck am I? 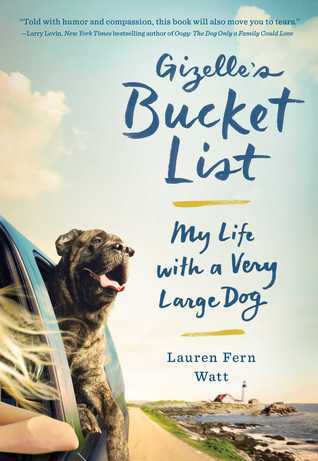 The playful, epic adventure of a 160-pound English Mastiff and the twentysomething girl who grew up alongside her—Marley & Me for a whole new generation. Lauren Watt took her 160-pound English Mastiff to college—so of course after graduation, Gizelle followed Lauren to her first, tiny apartment in New York. Because Gizelle wasn’t just a dog; she was a roommate, sister, confidante, dining companion, and everything in between. Together, Gizelle and Lauren went through boyfriends, first jobs, a mother’s struggle with addiction, and the ups and downs of becoming an adult in the big city. But when Gizelle got sick and Lauren realized her best friend might not be such a constant after all, she designed an epic bucket list to make the absolute most of the time they had left. Bursting with charm, this unique, coming-of-age story of a girl making her way through life is a testament to the special way pets inspire us to live better, love better, and appreciate the simple pleasures. Gizelle’s Bucket List is the humorous, poignant lesson our pets teach us: to embrace adventure, love unconditionally, and grow into the people we want to be. I do animal rescue and rehab. My husband and I take in sick and needy cats and in the spring we take in injured or orphaned animals and birds and raise them until they can be released. I currently have two senior rescued dogs that are near the end of their lives. I love a lot of sick and dying animals. Give them the best life they can have. So I jumped at the change to read this book. I really, really enjoyed it, but I didn’t love it. I think it’s the kind of book that any animal love will like but it wasn’t quite what I was expecting. I was expecting more of the book to deal with Gizelle’s bucket list. The writing and storytelling was solid, but for me there was something missing. I think I would have liked more depth to the story. (FYI I always feel SUPER WEIRD reviewing memoirs.) What I mean is I think I would have liked a bit less about before Gizelle got sick. It was those chapters dealing with the bucket list that really drew me in and kept me glued to the book. With that being said, I still recommend this for anyone who loves animals or has had to say good-bye to a beloved pet.